San Antonio rapper Robert Encinas, who goes by the name 7vnseal, has been working hard lately to represent his newfound Savior using his talents in the rap game. Before giving his life to Jesus a couple years ago, 7vnseal went by the name 80proof (aka Illa Instinct), and was an affiliate of Killarmy and Shyheim, who in turn were affiliates of the mainstream supergroup Wu Tang Clan. Since moving on and picking up the cross of Christ, he's changed his name, and has dropped his first release as 7vnseal, a mixtape called Keep My Boots Madd Muddy, Platoon Volume 1. Formerly affiliated with Universal Records, 7vnseal has opted to take the independent route, so as not to have a major label controlling his message or style. 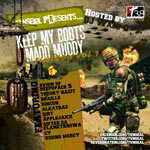 Keep My Boots Madd Muddy is his first independent release since leaving Universal, and it definitely bears the marks of an independent musician. It's pretty raw and, at times, slightly underpolished. However, this can also be attributed to his partnership with Wu Tang, a group known for their raw, gritty, straightforward take on rap music. However, some of the tracks are a lot quieter than the rest, like "Double Edge"; whether they were purposely left that way isn't really clear, and it's possible that the tracks were just skipped over during the mixing stages. I do like how 7vnseal keeps true to the idea of "the mixtape" (or at least the modern mixtape) by having a lot of short tracks that just pop out of nowhere and some tracks that flow directly into the following track. It's also cool to see some more recognizable hip hop artists make appearances, though some are very brief. Humble Beast artists Theory Hazit and Braille both have short verses in the quick tracks "Lightning Strike" and "Knuckle Fist," respectively. You also hear an alright verse from Willie Will in "Snuff Bottle," a verse from CY in "Blades of His Glory," then later in the mixtape's highlight "How You Living," you get a solid verse from Deepspace 5 crewmember Sivion. In fact, everything about "How You Living" is pretty solid. The beat is dope and 7vnseal, Gifted da Flamethrowa and Sivion all bring it in their verses. This is surely the best track on the mixtape. As far as 7vnseal himself, he has a pretty good flow. You can really hear the Wu Tang influence in both his vocals and his overall style, thus it's mostly for those who call themselves fans of the group. Hip hop fans who usually listen to more refined and cleaner hip hop may be a little turned off by what you get from 7vnseal. That's not to say he's not talented, though; it's just that his stuff is a bit grittier, and may be perceived that way by some. I think he may need to spend a little time refining what he does, but even if he doesn't, his tracks are still rather enjoyable. In addition to 7vnseal's part, the mixtape is hosted by DJ Wade-O, who has done recent work with hip hop group theBREAX for two mixtapes of their own. Wade-O is a talented DJ, who puts some good cuts into the tracks, aiding in the true mixtape sound. There are some times where the samples feel a bit misplaced, and drown out the music; however, this is also part of the mixtape experience (Not my favorite aspect of a mixtape, but an aspect nonetheless). With twenty-four tracks, the main thing that holds the mixtape back is its length (despite it clocking in at less than an hour). Future mixtapes (or studio albums) may fair better with less tracks. I'd also love to see 7vnseal refine his rapping ability in the future, which could really boost his appeal and give him a platform to reach more hip hop fans for Jesus (as many non-Christian hip hop fans are really into well-produced, or over-produced, hip hop music like Jay-Z and Kanye West these days). But Keep My Boots Madd Muddy is not a bad start to his newly-focused music, which you can download for free through SendSpace [http://www.sendspace.com/file/74iiwq -- **the link was provided by 7vnseal himself].